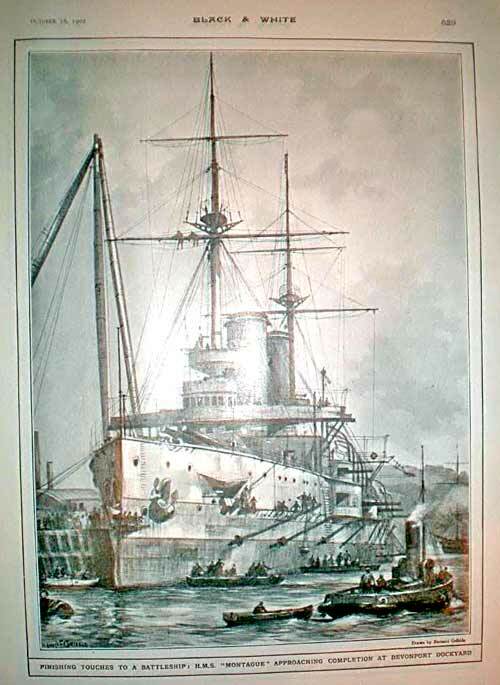 Montagu was one of five Duncan-class ships of the same period, ordered by the Admiralty to counter the French and Russian ship-building activities. It was believed, mistakenly in the event, that the Rusian ships were fast and heavily armed, but the British Duncans outclassed them in both speed and firepower. 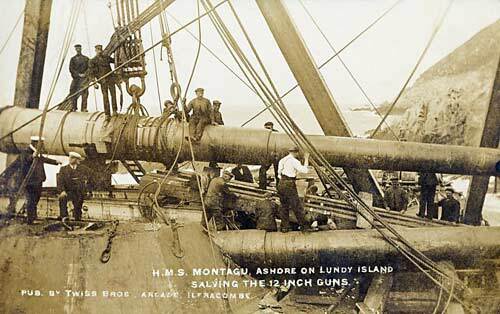 Unfortunately HMS Montagu survived only three years from commission. Having first operated in the Mediterranean for two years she then joined the Channel fleet based at Portland from 1905. In 1906 she was testing wireless equipment in the Bristol Channel and, in May that year, when thick fog came the decision was made to anchor off Lundy Island. Instead of anchoring two miles off as planned, Montagu had travelled into a spot off Lundy called Shutter Point. This proved to be fatal - she ran hard aground, couldn't be moved, and subsequently became a wreck upon that very spot. Her captain and navigating officer were held responsible and court-martialled. As it happened she would have become obsolete anyway, since a new class of battleship was being built at this time, outclassing the Duncans - the Dreadnoughts. A flight of steps were built to facilitate the salvage of HMS Montagu, they became known as The Montagu Steps. Salvage continued for many years until 1922 when the wreck broke and sank. The steps are apparently still there but now in dangerous condition. A RECORD FOR THE BRITISH NAVY. One may search our Naval annals from end to end, and, for that matter, those of other great powers which boast of a large sea force, but it is certain that they will not produce anything like the record which Great ~Britain established on Tuesday, ~March 6. The Admiralty then arranged that four warships should “take to the water” at our Royal Naval Dockyards within an hour or so of ne another. The nearest approach to this parallel was probably the launching, many years ago, at Devonport of the cruisers Talbot and Psyche. The took the water within an hour of one another. 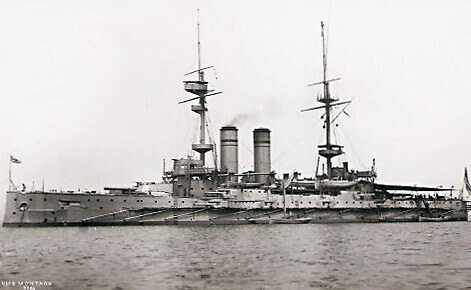 The quartet launched on March 5 consisted of the first-class battleships Montagu, at Devonport, and Albemarle, at Chatham – two of the Duncan class: and the armoured cruisers Kent, at Portsmouth, and the Drake at Pembroke Dock. These four powerful warships would, in themselves, make a good show as a squadron, and, added to the battleship Russell, launched quite recently, and others which are on the verge of completion, would help to form a fleet the sixe and fighting qualities of which would put to shame the Navies of some European smaller nations. are sister ships, each of 14,000 tons displacement. They will be fitted with 18,000 indicated horse-power, which are estimated to give a speed of 19 knots, compared with 18½ knots of vessels of similar dimensions. The vital parts of these vessels will be protected by a belt of armour of Harveyised [sic] steel, seven inches in thickness and extending in length of 209 feet, tapering off to three inches in thickness at the bow and stern. The ships were commenced at different times, and it is more a matter of coincidence than anything else that they should have awaited simultaneously the “breaking of the bottle”. In the construction of a warship, much naturally depends upon the delivery of armour from private firms, and the testing of every plate, in the rapidity with which she is got out of hand, for we are not in the habit of swelling our Navy with anything but that which will withstand the shot and shell of an enemy and which can repay with interest all that she receives. belongs to a new class of armoured cruiser, her consorts being the Essex, Monmouth and Bedford. They are each of 9800 tons displacement, and will have engines of 22,000 horse-power, capable of giving a speed of23 knots. The boilers will be of the Niclausse [sic] type, and the principal armament will consist of fourteen 6-inch quick-firing guns and twelve 12-pounders. A large number of smaller weapons will be carried. They will be protected by a four-inch armour belt of Harveyised steel, and the casemates will also have a four-inch armour protections. The dimensions of the Kent are: length 440 feet; breadth 66 feet; draught 24½ feet. Special interest attaches to THE CARRIER DRAKE, built at Pembroke Dockyard. She is the largest modern ironclad constructed at the Naval Dockyard, having a displacement of 14,100 tons. Her engines, of 30,000 indicated horse-power, are estimated to give a speed of 23 knots. She is named after that gallant Devonshire sea-captain, Sir Francis Drake, who showed his sterling worth at the time of the Spanish Armada. The Drake is one of a new class of four which the admiralty is said to be keenly interested in, for they are termed “MIGHTY CRUISERS,” and are built for the express purpose of destroying an enemy’s commerce. In accordance with a time-honoured custom which confers upon the wife of a Naval Commander-in-Chief the privilege of naming the first warship launched at a port at which he is the senior officer, the Montagu was launched by LADY CHARLES SCOTT, wife of Admiral Lord Charles Scott, K.C.B. 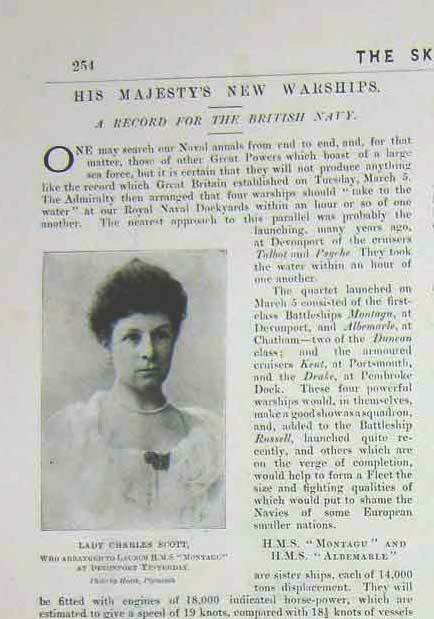 whilst at Chatham the Albemarle was christened by Lady ~~Kennedy, wife of Vice-Admiral Sir W.H. Kennedy, C.B. Both Admirals have assumed their command since the last warships were launched at those ports. Mrs Barlow, wife of Captain-Superintendent C. Barlow, D.S.O. launched the Drake. Wikipedia . Accessed 4 March 2012.
 www.geograph.org.uk/photo/582734 Accessed 4 March 2012.